Yesterday The Economist Intelligence Unit and Buzzdata launched a $10,000 contest to help enhance The Economist’s “Best city in the world” index. Yes. It’s a data and visualization competition to identify the best city in the world to live. As part of the contest, The Economist Intelligence Unit has shared two data sets, its “liveability” and “cost of living” indices for 140 cities around the world. This is, in of itself, pretty cool. But the contest moves beyond their data. As the website outlines, the competition’s core objective is to not just use this data, but figure out what other data sets should be used. Your mission: to create a new “liveability” index, using the 140 cities in the EIU’s datasets, that determines which is the best city in the world to live in, using these datasets PLUS any additional publicly available data sources that you wish to use (note: see the Contest Rules for information on using additional data). You are also required to create a visualization of the new index that you’ve created. If you’ve always felt that some important factors in livability and quality of life have not been getting the attention they deserve, now is a chance to change (or add them to!) the debate. You can check out the rules and judging criteria, as well as sign up, over at the contest’s webpage. I, sadly, won’t be participating in the competition as… I’m pleased to share that I’ll be helping to judge the contest. This entry was posted in open data and tagged contest, municipal, opendata on February 2, 2012 by David Eaves. Hey David, so glad to see you blogging about the contest! We’re already receiving submissions, which is really exciting. I’m going to make a point of rooting out and pointing to cool public data resources that people might want to make use of over the course of Feb, to help bolster people’s data-mining creativity :) Off the top of my head, I just heard that the Gov’t of Canada announced the addition of 6,000 new datasets to data.gc.ca, some of which include socio-economic datasets, which might be really interesting to mash up, but I have to take a closer look. 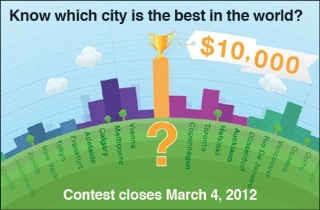 For anyone interested in tracking the contest, the projects and the discussion, follow along at #bestcitycontest on Twitter or check in and follow our Topic page on BuzzData (search for the Best City Contest) topic at buzzdata.com.